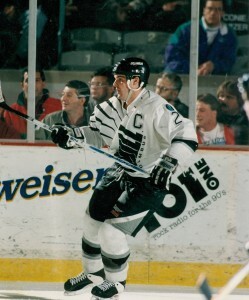 All-Time Columbus Chill Team member and captain Defensemen Lance Brady. Lance Brady (1993-95): Had 11 goals and 47 assists for 58 points and 281 penalty minutes in 122 games… In 1993-94 he had 27 points (5-22), 130 PIMs and a +21 in 56 games. The next season he collected 31 points (5-26) in 66 games with 151 penalty minutes… True leader on the ice and in the locker room… Played at Holy Cross before joining Chill…Senior Project Manager at Microsoft in Greater Boston area… Head coach, Assumption College in Worcester, Mass.